Today’s free web design resource is a pack of four Bootstrap 4 Footer templates. They are very simple and come with a logo section, navbar menu, fullscreen background image, social icons and more. You can use them for inspiration or as a starting point to create your next website project, since each template comes with some other example sections, apart from the footer. Continue reading below to find the live preview and download links. Enjoy! A footer template with a static position at the bottom of the page, with a light background, about us section, contact info section, links section and social icons. A footer template with a logo section, dark background, about us section, contact info section, links section and social icons. 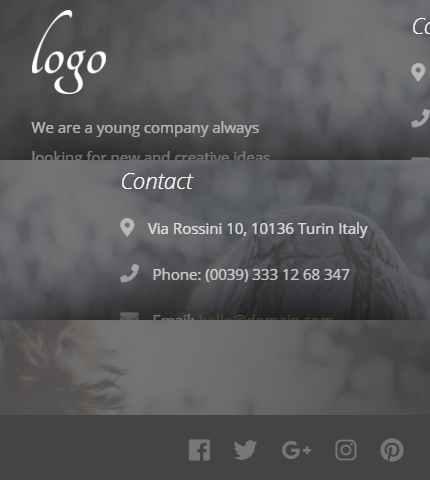 A footer template with navbar menu at the bottom, dark background, logo, about us section, contact info section and social icons. A footer template with fullscreen background image, logo, about us section, contact section, links section and social icons. Download the zip package below and extract it. Each template / layout is in its own folder called “template 1”, “template 2” and so on. Use the “index.html” file to modify the HTML code. The style can be changed from the “style.css” file in the “css” folder (assets/css). The images are located in the “img” folder (assets/img). The favicon and the Apple touch icons are in the “ico” folder (assets/ico). You can use these templates in personal and commercial projects, but you can’t sell or distribute them directly, “as is”. If you plan to use them, a link to this page or any form of spreading the word will be much appreciated. How To Create a Website Quickly If You’re Not a Developer and Can’t Hire One? Bootstrap 4 Carousel with Multiple Items: How To Create It? Some pages of this site contain affiliate links to products or services that I recommend. This means that if you click on these links and purchase the product/service, I might get a commission at no cost to you.